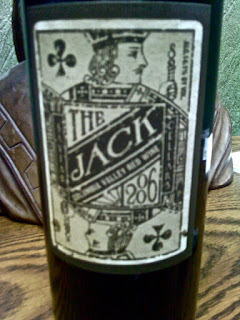 2006 Saviah Cellars "The Jack"
This Columbia Valley red blend had such a cool label that I thought I would purchase it at my local wine shop. Oh, and if you're not shopping at your local mom & pop wine shop shame on you! Anyways, this wine is composed of 88% Merlot, 6% Cabernet Sauvignon, 4% Cabernet Franc, and 2% Syrah. The grapes were sourced from various vineyards throughout Yakima, Walla Walla, and the general Columbia Valley AVA. The wine was aged in 100% American oak (30% New) and is a total production of 3500 cases. On the nose I get aromas of concord grape jelly, candied blackberry, coco powder, plum, and hints of spicy oak. It's fun to smell a wine aged in all American wood! To me it imparts a lot more aroma into the wine and seems even a bit clumsy.